Blue & Gold Fleet Posts One Million Dollar Reward Leading to the Arrest of Escaped Alcatraz Prisoners Frank Lee Morris, John William Anglin and Clarence Anglin. San Francisco's Blue & Gold Fleet posts a 1 million dollar reward for information leading to the arrest of escaped Alcatraz federal prisoners Frank Lee Morris, and brothers John William Anglin and Clarence Anglin. 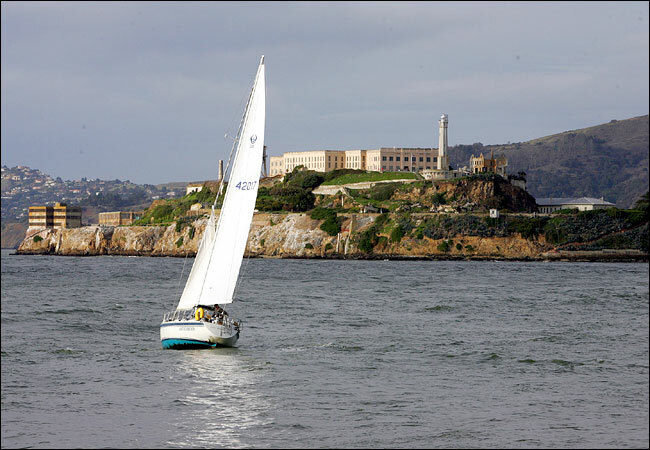 The missing criminals escaped from Alcatraz 41 years ago, but are still being pursued by the exclusive ferry service provider to Alcatraz, Blue & Gold Fleet. To aid in the quest for the trio of missing inmates, John Walsh, host of America's Most Wanted, featured the intriguing story entitled "The Great Escapes" on his national television show on Saturday, May 3, 2003. The Blue & Gold Fleet wants to resolve this decades old mystery by soliciting the help of the public to find Frank Lee Morris and the Anglin Brothers. Realizing that the men are now in their 70s they're still worth capturing to put a lawful end to the mysterious manhunt. It was on the evening of June 11, 1962 when the three convicts pulled off the seemingly impossible caper successfully orchestrating their elaborate plan. Frank Heaney, former Alcatraz guard and author of the book, Inside the Walls of Alcatraz says, "I personally would like to come face to face with these inmates to set the record straight, in order to accurately rewrite the history of Alcatraz." For valid information leading to the arrest of the above named criminals, the public is encouraged to notify the Blue & Gold Fleet at 415.705.8200, or notify America's Most Wanted at 1-800-CRIME-TV. Reward will be paid to the first person who provides information May 3, 2003 to June 3, 2003. Fugitives must still be alive. Open to the public since 1973, Alcatraz is a 22-acre island in San Francisco Bay, and is designated part of the Golden Gate National Recreation Area. More than 1 million national and international visitors tour the federal penitentiary annually. him in "Birdman of Alcatraz." Mr. Heaney ought to know. From 1948 to 1951, between serving in World War II and the Korean War, he worked as the youngest correctional officer in the history of Alcatraz, the former federal prison that was infamous as the end of the line for the nation's most incorrigible and violent criminals. This macabre and inhospitable world is now a museum that lures more than a million visitors a year, and Mr. Heaney is one of the few people still living who can differentiate reality from myth. Mr. Heaney, who is 79, regularly makes the trek back to the island to share his memories and to sell and autograph his book, "Inside the Walls of Alcatraz." But now his visits are only once a month, down from nearly a dozen a month before a stroke slowed him down two years ago. "I don't mind coming back because the clientele is better," he said, joking. "I'm kind of a ham. But I don't know for how much longer. When I feel that I don't have any more fun I guess I won't do it." Using a bullhorn, park rangers introduce Mr. Heaney to the hundreds of visitors debarking the ferry, who whoop and clap and part the way for him as he shuffles his walker toward the microphone.The National Park Service, which oversees Alcatraz, has begun to prepare for the day when the island's former inhabitants are no longer living. Back in the day, new prisoners arrived there first, were lined up, strip-searched and issued prison garb before entering the cell house for the first time. A larger museum store next to the shower room will contain temperature-controlled cases for artifacts now kept in storage in San Francisco. Park service curators are still combing through items like lead-filled "saps" or billy clubs used illegally by the guards and homemade shivs made by the prisoners. The dummy heads that fooled guards during the renowned escape of 1962, the subject of the 1979 Clint Eastwood movie "Escape from Alcatraz," are also up for consideration. The park service allows 3,000 visitors on the island each day. (Adult tickets are $16.50 with an audio tour; children 5 to 11, $10.75.) The service does not announce Mr. Heaney's visits beforehand, so tourists do not know they will hear the kind of rich detail that only a former prison guard would know: like how he counted the knives in the kitchen after every meal. "There is no substitute for having someone who lived here or served time here or worked here," said George Durgerian, a park ranger on Alcatraz. "But what the park service is doing is making the best out of what is going to happen. Because time is going on and we can't stop it. "So they plan as best they can for the day when Frank Heaney won't be able to point to the shell of a building and recall what it was like to be 21 years old, fresh out of the Navy, fair haired, skinny and intrepid. As tourists study the damp rooms with mint-green chipped lead paint, Mr. Heaney recalls how the guards paid $10 a month for "a bed and a bureau" and 25 cents for a meal. The bread was good, he says, when it was right out of the oven. He remembers there were card parties and Saturday night dances when girls would come over to the island. But there was the tedium of night watch and the embarrassment of inmates' blowing kisses at him. And there was weekly bath duty when Mr. Heaney stood guard over the Birdman's tub to make sure he did not kill himself. "You struggle to get the history by reading primary source material and doing re-enactments," said Jan Turnquist, a tourist from Concord, Mass., who is the executive director of Orchard House, the home of Louisa May Alcott. "But here's the real deal." She asked Mr. Heaney to autograph his book in the cafeteria after he recounted the prison's spaghetti riot of 1950, when angry inmates could not take one more meal of bland starch and guards shattered tear-gas canisters with machine gun fire to quiet them down. "I kept thinking, 21 years old, so young," Ms. Turnquist said, clutching the book. "He must have been terrified." island doesn't need me. It can get by on its own." The time is 1939. Prisoners, shackled to one another, climb off a barge onto a dock. Guards armed with shotguns hover nearby. "Welcome to Alcatraz," says one guard in an unwelcome voice. Marc Rocco, the director, is shooting a scene for the film "Murder in the First," on the site of what was once this country's most infamous prison. Speaking in a whisper, Kirk Petruccelli, the movie's production designer, said: "At night it's very scary, very mysterious here. When the fog rolls in, it's unbelievably eerie. You almost hear voices." The voices depicted in this film, which is to be released next fall, are based on a real-life drama Hollywood studios have flirted with for years: the brutal imprisonment of Henri Young, an impoverished youth whose act of petty theft more than 50 years ago set off a chain of events that helped lead to the closing of the "Rock" as a Federal penitentiary in 1963. Robert F. Kennedy, then the Attorney General, cited the case as one reason for shutting down the prison, isolated on an island in the middle of San Francisco Bay. It was on a foggy night in 1939 that Henri Young and four other inmates tried to escape from Alcatraz. Kevin Bacon portrays Henri Young in "Murder in the First," Christian Slater is his Ivy League lawyer, Gary Oldman plays a vicious warden and Embeth Davidtz -- who played Helen Hirsch, the brutalized maid, in "Schindler's List" -- is Mr. Slater's law colleague and lover. Mr. Rocco, the 30-year-old director, said that some of the characters are composites, but that the story of Henri Young is intact. "What this is, is really the story of these two men, coming from totally opposite sides of the tracks and realizing their common bond," Mr. Rocco said of the convict and his lawyer. "But it's also a commentary about a prison system that was unbelievably horrible." The movie, budgeted at $20 million, is Mr. Rocco's first large-scale production. His last film, "Where the Day Takes You," about homeless teen-agers in Hollywood, received mixed reviews but led to a burst of interest among studios and agents. He was offered a number of scripts, including "Murder in the First," written by Dan Gordon. The script, based largely on newspaper articles, had been circulating in Hollywood for several years, with many stars, including Tom Cruise, toying with the project. Mr. Rocco, the son of the actor Alex Rocco, revised the screenplay with Mr. Gordon after spending nearly nine months researching the case in archives, libraries and watching newsreel and archival scenes. He also interviewed former convicts and lawyers. The real Henri Young was an impoverished teen-ager in the Depression who stole $5 from a store that also doubled as a Post Office. As a result, his crime was a Federal offense. He was sent to the Leavenworth Federal penitentiary in Kansas. He tried to escape, was seized, became a troublemaker and was deemed incorrigible by prison authorities. At that point, he was sent to Alcatraz. On Jan. 13, 1939, he and four other men tried to escape on a raft. One, Arthur (Doc) Barker, the youngest son of the infamous bank robber Ma Barker, was killed. The others, including Young, were seized, apparently after a prisoner betrayed them to authorities. For the killing of an Inmate, Young was placed in a dungeon in brutal confinement for three years. Hours after his release from solitary, he confronted the man who had betrayed him in the prison dining room. In front of hundreds of prisoners, Young killed the man with a spoon. Mr. Bacon, who shed 25 pounds and shaved his head for the role, said he was "totally spooked" by the part. He spent a night in solitary confinement on a film set just before "Murder in the First" began shooting, and nearly three weeks, from morning to night, making the movie in the dungeon. "To be honest, I almost went nuts playing this part," said Mr. Bacon as he sat in his spartan dressing room, which is a former cell. "There's no light. It's wet. You're in shackles. You're naked. It's horribly cold. There are rats and bugs. It was a nightmare. And I was in a controlled situation. I can't imagine living it." "There's nothing more boring than actors talking about how the parts we play influence our lives," Mr. Bacon continued. "That's kind of nonsense. But this part, well, psychologically, I was a basket case. It's all pain. It's all so raw. There's no break. There's no good day. It's all anguish." As Mr. Bacon spoke, he rose and walked past the former cell of Robert Stroud, the "birdman of Alcatraz," perhaps the most famous prisoner on the island. Mr. Stroud spent 43 years in solitary confinement after killing a prison guard in 1916. He spent 17 years in Alcatraz. In his cell -- 12 feet long and 6 feet wide with a small, barred window -- Mr. Stroud gained extraordinary fame as a breeder and caretaker of birds. He died at the age of 73 in 1963, the year after "Birdman of Alcatraz" was released. "I have never had any fear of death, probably because most of my life has been so miserable," Stroud said before his death. Although Alcatraz has been closed as a Federal prison for decades, its history -- and memories -- remain powerful. Frank Heaney, a former guard who helped with research for the film and who serves as a consultant on prisons for other movies, said he had met some of the more notorious inmates, including George (Machine Gun) Kelly. "A good inmate, an altar boy," Mr. Heaney said of him. "Of course, Al Capone was an altar boy, too." Mr. Heaney left Alcatraz when he was drafted during the Korean War. He never returned to that job. "It was the most depressing job," he said while riding on the tugboat from San Francisco to the island. "If you were a guard, you lived on the island, too. You lived right at the prison. That got to me. You had some of the most violent and difficult inmates right there. There were no radios, no paroles, no rehabilitation. It made you kind of despondent." Mr. Heaney grew up in Berkeley, Calif., and became a guard at the age of 18, he said, after seeing too many movies about prisons. "I saw all those Pat O'Brien and George Raft movies, and I was enthralled," he said. "But then I became a guard and realized Hollywood prison movies were all wrong. I wasn't prepared for the real thing. The real thing was pretty bad." An article on March 3 about the filming of "Murder in the First," a movie based on the life of a 1930's convict named Henri Young, included several erroneous descriptions of events in his life supplied by the film makers. A March 16 letter from the Federal Bureau of Prisons points out that Mr. Young went to Alcatraz after serving time in two state prisons for burglary and robbery. His subsequent Federal crime was bank robbery, not theft from a post office. He did not commit suicide at Alcatraz in the 1940's; he completed his sentence there in 1954, then served a term in Washington State Penitentiary for murder. He was paroled there in 1972, and it is not known where he is or whether he is alive. This corrrection was delayed by checking at The Times.